We Techies are collaborating with The Steps (www.thesteps.co). A platform for students and fresh grads, or just anyone looking for a job change. They offer professional services to team you up with a mentor of your interested industry. If you’re looking to join an exciting tech startup, or want work experience from various industries including: consulting, finance, engineering, and technology, do get in touch! They are looking for driven and self-starting interns who would like to join the expanding team at The Steps! As a campus ambassador, your job will be to implement marketing campaigns to increase the awareness of their platform at your campus and to drive user engagement. You’ll have regular conference calls with the company’s founders to discuss potential targets, ideas, and goals. You will get great training for real world work experience, references and play a crucial role in the growth of an early stage startup! Although this is an unpaid internship position, you will get a ton of benefits. Including these: a fast learning curve to feed that brain of yours, an exposure to the real life of adulthood, and to be part of an exciting start-up that will impress on your resume! Do sign up at the form below if you’re interested – http://goo.gl/forms/gtF49W9gzn. For any questions, please email general@thesteps.co. Jonathan Low’s 5 Star Service. posted in Events	on November 3, 2015 by	Soon Seng Comments Off on Jonathan Low’s 5 Star Service. 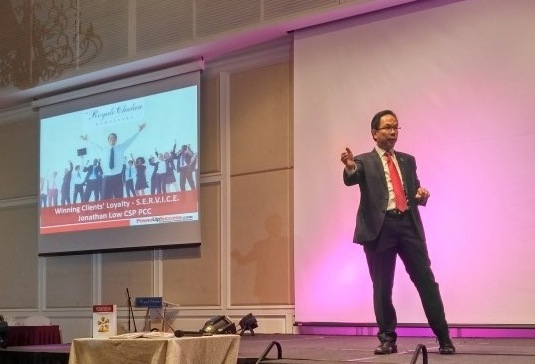 An energetic and inspiring 90 minutes display from Jonathan Low, one of Asia’s leading speakers in the Art of Hospitality. We deal with people (whether we like it or not!) on a regular, if not everyday, basis. Whether you’re being served for your lunch, in a taxi ride home, or being greeted in a mall; all of these things fall under SERVICE (see above). And this is what Jonathan delivers to us through his motivational speeches. To keep us all entertained, and off our phones, Jonathan delivered his real life experiences and short stories to show us ways to deal with situations, and paths we choose can determine the outcome (and to brighten someone’s day). He shared this with us. On one incident, his flight had been cancelled, so he was re-ticketed onto the next flight out. He managed to reach his final destination, which was great. Everything went smoothly, until he realised his luggage was left behind! B: smile at the guy and understand that he’s just a company employee who unfortunately has to deal with this on a regular basis. By choosing to talk to him in a calm manner, and understanding that shouting at him in frustration will not get your luggage back any quicker. Now just taking a few seconds to think about both, before you act. You can really change everything around, if you just try putting yourself in someone’s shoes. Thank you to Jonathan for giving such a meaningful speech where anyone can practice and apply to, no matter what situation you are in.